Many climate-related hydrologic variables in New England have changed in the past century, and many are expected to change during the next century. It is important to understand and monitor these changes because they can affect human water supply, hydroelectric power generation, transportation infrastructure, and stream and riparian ecology. This report describes a framework for hydrologic monitoring in New England by means of a climate-response network. The framework identifies specific inland hydrologic variables that are sensitive to climate variation; identifies geographic regions with similar hydrologic responses; proposes a fixed-station monitoring network composed of existing streamflow, groundwater, lake ice, snowpack, and meteorological data-collection stations for evaluation of hydrologic response to climate variation; and identifies streamflow basins for intensive, process-based studies and for estimates of future hydrologic conditions. 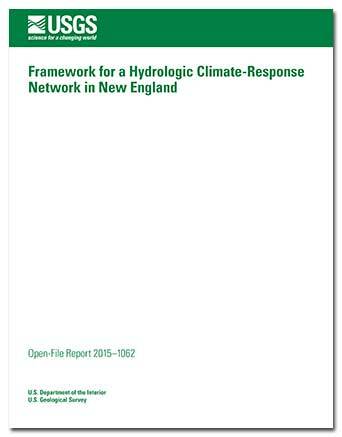 Lent, R.M., Hodgkins, G.A., Dudley, R.W., and Schalk, L.F., 2015, Framework for a hydrologic climate-response network in New England: U.S. Geological Survey Open-File Report 2015–1062, 34 p., https://dx.doi.org/10.3133/ofr20151062.